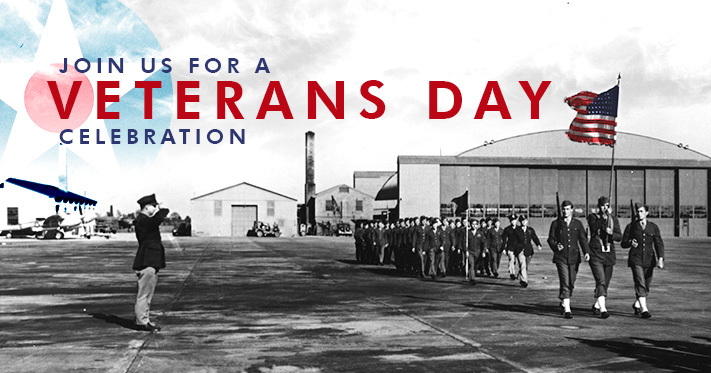 Join us at the AMC Museum for our 2018 Veterans Day ceremony on November 11th. The museum opens at 9:00 a.m. and seating begins inside at 9:50. The ceremony begins at 10:50, rain or shine, with a film and opening remarks followed by posting of the colors. In addition to the Dover AFB Honor Guard and special guest speaker Colonel Eugenia Thornton, USA, (Ret. ), we will have music by the Milford Community Band. Charlie’s Hot Dogs will have food available in our canteen. The C-5 and C-141 will be open for viewing until 3:00 p.m. The museum will close at 4:00 p.m.
Veterans Day is a time to remember that the freedoms we enjoy as Americans have come with a price, and have been earned and perpetuated by the brave men and women who have answered the call to duty for their country. Without their dedication and sacrifice, America would be a very different place today. Come and join us in thanking America’s military veterans through this very special ceremony. Hi, there. I’m writing a story for a high school newspaper, and I was wondering if I am allowed to take photos during the ceremony. I just wanted to check so that I do not violate any rules. Thank you so much, and I look forward to attending on Sunday! Yes, you’re allowed to take photographs. Thank you for your question!